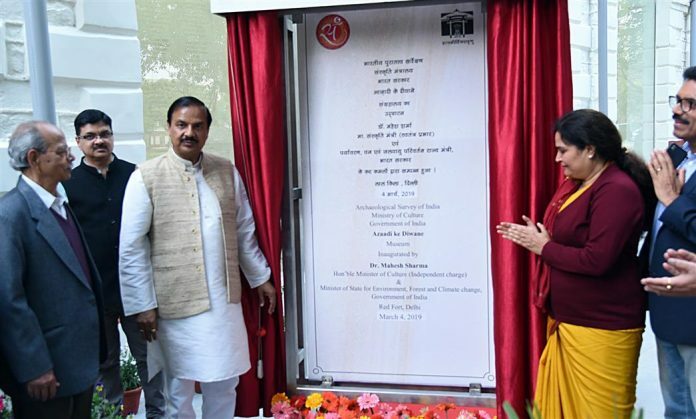 New Delhi: The Minister of State for Culture (Independent charge) and Environment, Forest and Climate Change, Dr. Mahesh Sharma inaugurated ‘AzaadikeDiwane’ museum at Red Fort, Delhi today. Created by Archaeological Survey of India (ASI), the museum within the Red Fort complex pays homage to all the unsung heroes of freedom struggle of the nation, who would have otherwise been merged away in forgetfulness. The museum is fifth in the series of recently inaugurated museums in the Red Fort Complex – others being, Subhash Chandra Bose and INA museum, Yaad-e-Jallian museum, Museum on 1857 – India’s first war of Independence and Drishyakala – Museum on Indian Art. The ‘AzaadikeDiwane’ museum talks about the sacrifices of great freedom fighters. It pays tribute to the selfless sacrifices of the revolutionaries, brave female freedom fighters and valiant children. Speaking on the occasion the minister said “Under the leadership of our Prime Minister Shri Narendra Modi this new museum ‘AzaadikeDiwane’ is started in the series of KrantiMandir to inspire the younger generation and letting them know the cost of freedom that the great fighters achieve by sacrificing their life.” He congratulated the team of ASI for coming up with this digitized and interactive Museum. The museum is a modern state-of-the-art, informative and educational exhibition, involving multi-sensory technologies to engage the visitors. It is so designed that as one moves from one section of the gallery to the other, a sense of awakening and spiritual awareness overwhelms an individual, a feeling of patriotism sweeps through, inspiring the visitors to relive the struggle of the Indian Freedom fighters and value the freedom that we so cherish today. Earlier, on 23rd January 2019, Hon’ble Prime Minister, Shri Narendra Modi inaugurated the Subhash Chandra Bose and Indian National Army (INA) museum at Red Fort, Delhi. The museum not only provides a detailed account of Netaji’s life and the history of Indian National Army (INA) but also showcases various valuable artefacts related to both. The Prime Minister on his visit to Red Fort Complex on 23rd January 2019, visited all these museums and gave his tributeto the memory of brave freedom fighters who laid down their lives for the nation. The Red Fort Complex also houses other museums – the Yaad-e-Jallian museum, the Museum on 1857- India’s first war of Independence and the Drishyakala- Museumon Indian Art. The Yaad-e-Jallian museum provides an authentic account of JallianwalaBagh massacre that happened on April 13th, 1919. The museum also showcases heroism, valour and sacrifices made by Indian soldiers during World War-I. The Museum on 1857- India’s first war of Independence portrays the historical narrative of 1857 war of independence, showcasing the valour and sacrifices made by Indians during the period while the Drishyakala- Museum on Indian Art showcases Indian art works from 16th century till India’s independence.